The Union Club of Cleveland chose GCFC President Ivan Schwarz for the Member Spotlight section of their internal magazine this month, highlighting Ivan’s accomplishments as well as his future goals for our organization. The Union Club is Greater Cleveland’s premier city club where business, civic, social and philanthropic leaders meet in friendship and shared purpose, striving for the betterment of themselves, their organizations and the citizens of the region. Ivan Schwarz is determined to bring a fair share of the billions of dollars spent each year on movie and TV production in the U.S. to northeast Ohio. And a quick look at the industry figures suggests he’s definitely on the right track. 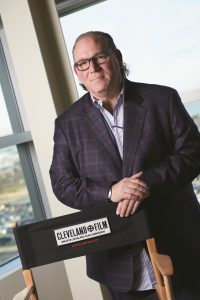 As President of the Greater Cleveland Film Commission, Ivan Schwarz has been instrumental in building the film industry in Cleveland from the ground up. Since the passage of the $40 million Ohio Motion Picture Tax Incentive in 2009, the film industry has produced more than a half-billion dollars in economic impact and created more than 1,900 full-time equivalent jobs in the region. These numbers are only a fraction of the success Ohio can have. Therefore, Ivan is focused on raising the Ohio Motion Picture Tax Credit again to $80-$100 million, which will put Ohio in the top five of desirable locations to film. Ivan, who spend a good part of the ’90s and ’00s traveling the globe as a location manager and producer for TV and film, including for popular shows like My Name is Earl and Entourage, came to Cleveland in 2006 with a vision of building a film industry here and adding value to the community. He had spent time in Cleveland in 1999 scouting locations as a producer for HBO’s Band of Brothers and had always been impressed with the people and potential of northeast Ohio. Ivan takes advantage of the Club’s networking opportunities and its meeting spaces, dining room and bar. “The Union Club is a beautiful club with a very professional and accommodating staff and great food,” he says. “We do a lot of wining and dining and the club is the perfect venue for entertaining visitors checking out Cleveland as their next location to film,” he says. Two recent movies shot in Cleveland – White Boy Rick starring Matthew McConaughey and the Sylvester Stallone feature Escape Plan 3 – will hit theaters in 2018 and Ivan teases upcoming announcements of other exciting projects in the works. Meanwhile, he’s busy building an industry, and with it, is bringing jobs and hundreds of millions of dollars in economic impact to our region. Stay tuned for more exciting filming in CLE.